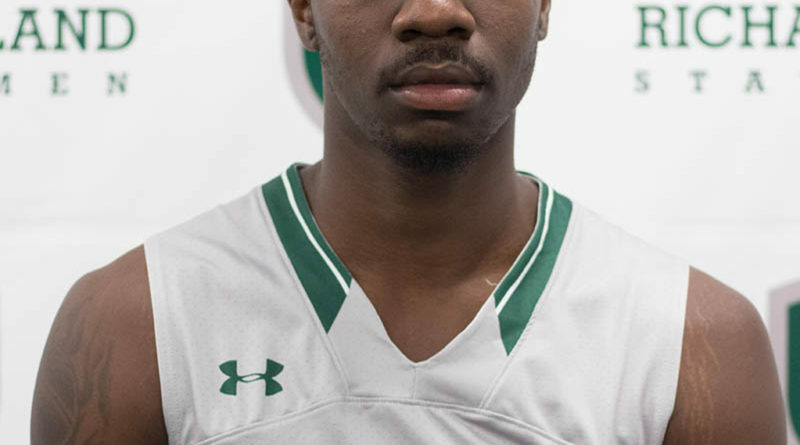 SOUTH PRINCE GEORGE, Va. — Richard Bland College sophomore men’s basketball standout Tim Bing Jr./Suitland, Maryland has been named the Athletics Department’s Athlete of the Week for the period March 6-12. 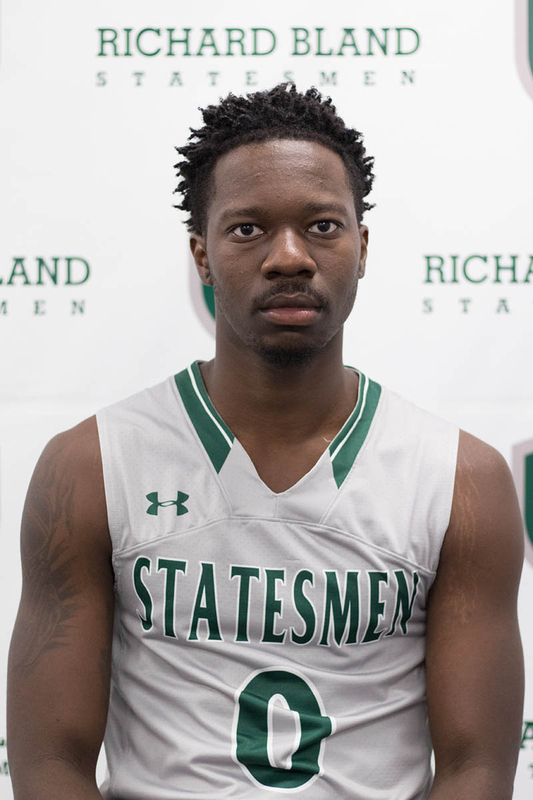 The 6-2 guard led the Statesmen (22-9) last weekend at the NJCAA Region 10 Men’s Basketball Tournament, including a 101-73 win past Fayetteville Tech (N.C.) in the semifinals on March 9, before a heartbreaking 96-95 setback to Louisburg (N.C.) in the final on March 10. 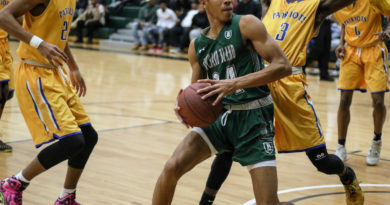 Bing posted 11 points, six rebounds, four assists and two steals against the Trojans, followed by 17 points, four rebounds, two assists and one steal against the Hurricanes. 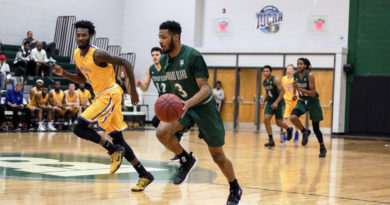 His efforts helped Richard Bland earn its second consecutive and third trip in four years to the NJCAA Division II Men’s Basketball Championship March 20-24 in Danville, Illinois. A second-year team member, Bing earned All-Region 10 Second Team honors this season. He has started 29 of 31 games, averaging 24.4 minutes, 11.2 points, 4.6 rebounds and 4.1 assists, while shooting 43 percent from the field (115-268), including 45 percent on three-point field goals (42-93), and 74 percent at the free throw line (75-102). 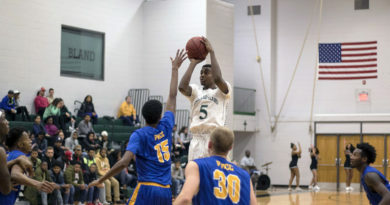 Bing adds 56 steals and one block, and has posted season-highs of 21 points at Catawba Valley (N.C.) (12/2), nine rebounds three times, most recent vs. Vance-Granville (N.C.) (2/25), 10 assists vs. Guilford Tech (N.C.) (1/27), five steals two times, most recent at Louisburg (N.C.) (2/7) and five three-point field goals at Catawba Valley (N.C.) (12/2). He has 17 double-figure scoring games, including three 20-point games, with one double-figure assist game. This is the third time that Bing has been selected for the weekly honor, as he previously garnered the award last fall (November 6-12) and once last winter (February 8-14, 2017).